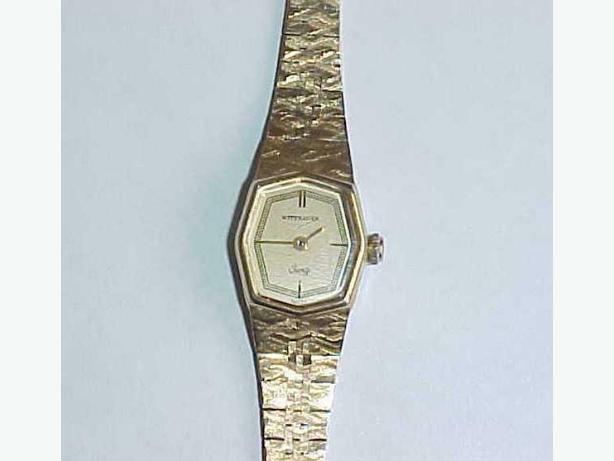 THIS STYLISH LADIES QUARTZ WATCH WAS MADE IN SWITZERLAND BY WITTNAUER. IT IS MARKED ON THE BACK BASE METAL BEZEL STAINLESS STEEL BACK. THE OVER ALL LENGTH OF THE WATCH AND BAND IS 18 CENTIMETERS. THERE IS AN INSCRIPTION TO THE ORIGINAL OWNER ON THE BACK. THE WATCH IS IN VERY GOOD CONDITION AND KEEPS TIME WELL. THE BATTERY IS NEW.